Hi, everyone! 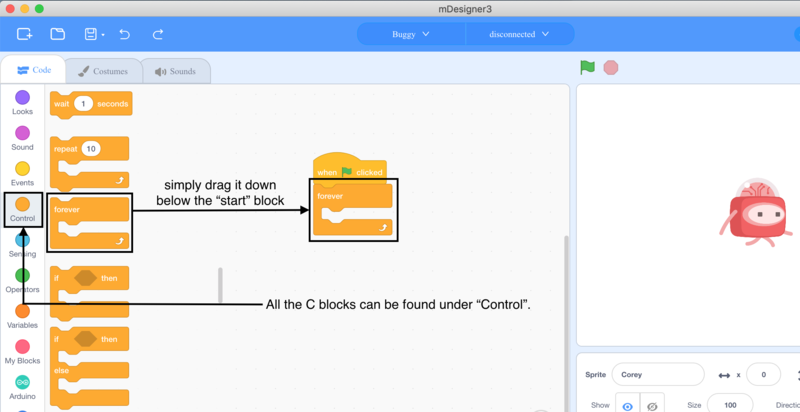 This is the tutorial to show you how to do programming in mDesigner3! 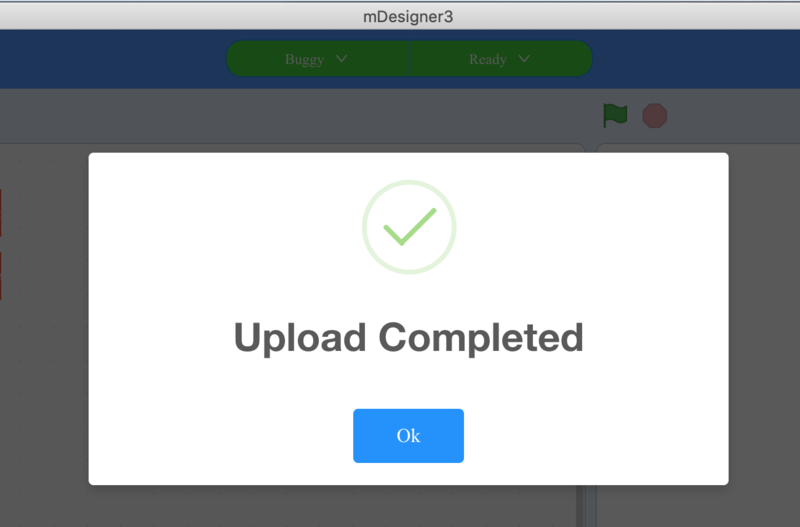 In mDesigner 3, there are two different modes: online and offline. The mode can be changed on the top right corner. Be careful! The online mode can only work with a "USB-to-MicroUSB" cable plugged into the Buggy battery. 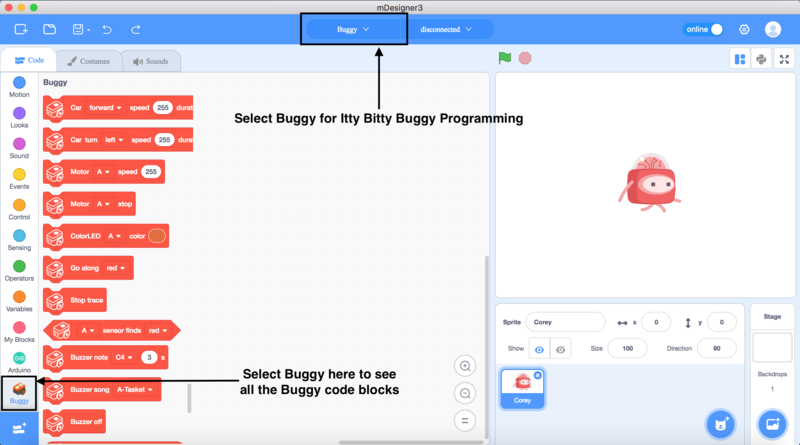 To use the Buggy code block for Buggy programming, first select "Buggy" which is located in the middle bar to access the Buggy code blocks on the left hand side. 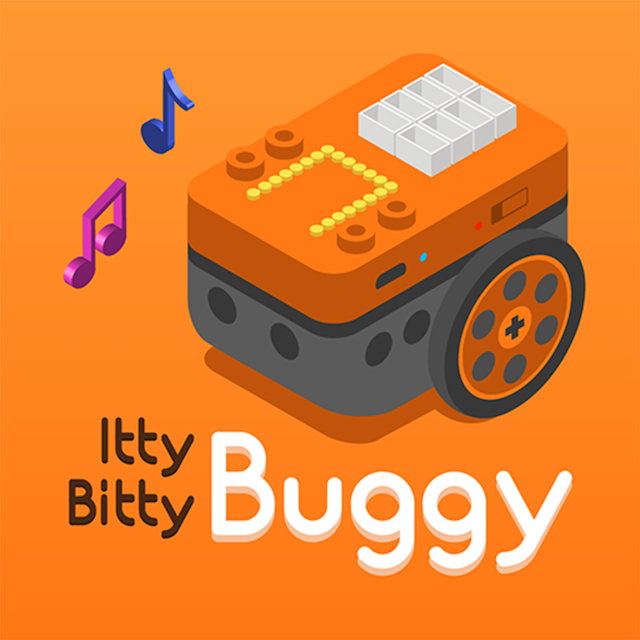 To access the controls of Buggy by programming, it is important to build the connection between PC and the Buggy. First: Plug in the "USB-to-MicroUSB" cable to "mCenter+" and turn on the battery. 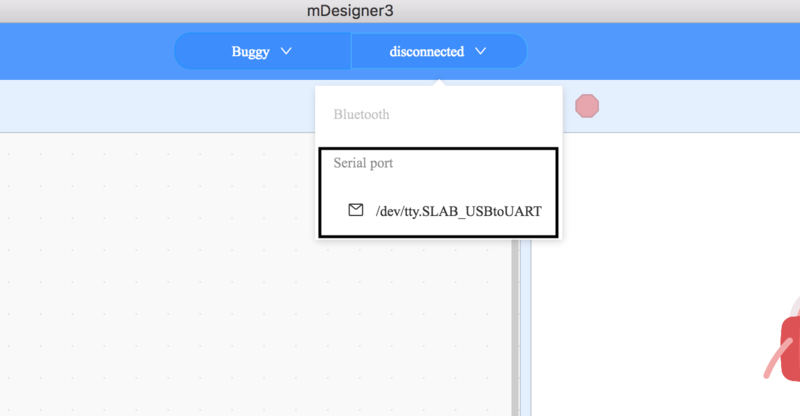 Second: Select the "Serial Port" option, located in the middle top bar's drop down menu below "disconnected". 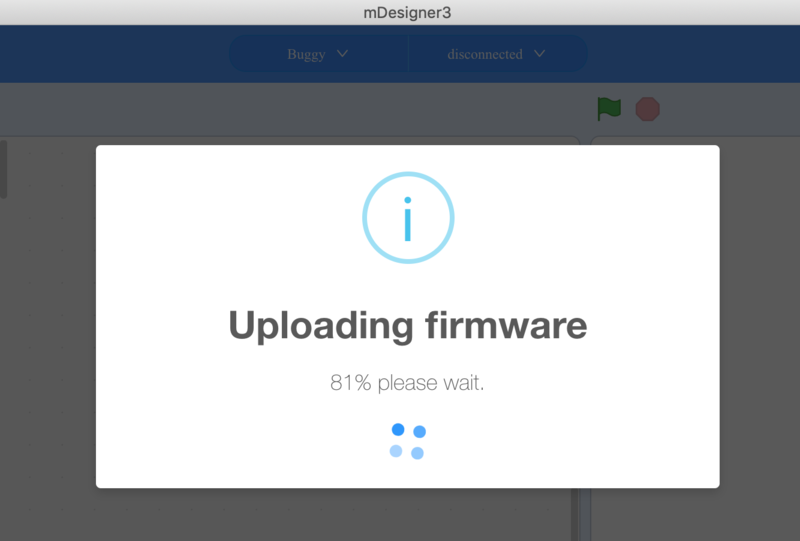 Third: Press "Flash firmware" to upload the firmware into Buggy. it can be done under the middle top bar's drop down menu. The screen will show the progress rate (seen in the picture below) and will say "Upload Completed" at the end. Last: If the top middle bar turns to light green color with "Ready" on the right side, Congrauation! You have already accessed the Buggy controls in online mode. Under Online Mode, people can conduct real time testing with Corey using the “Motion”, “Looks” and “Sound” code blocks. For example, instead of having Corey to say "Hello! ", can have him to say the “Read finder” value from the Buggy sensor! How to control the Buggy with different code blocks? A Hat block is needed to drop down from Events first. Hat blocks are the blocks that start every script. They are shaped with a rounded top and a bump at the bottom. This is the "start" of the program, and it is very important to drag this block down first for every program. For the next step, a C block (called "forever") will be simply added under "start". C blocks is also known as "Wrap blocks", these blocks loop the content within the C's or check if the condition is true. The "forever" C block means it will repeat the contents inside forever. The "start" Hat block and "forever" C block is usually a basic beginning to the program. 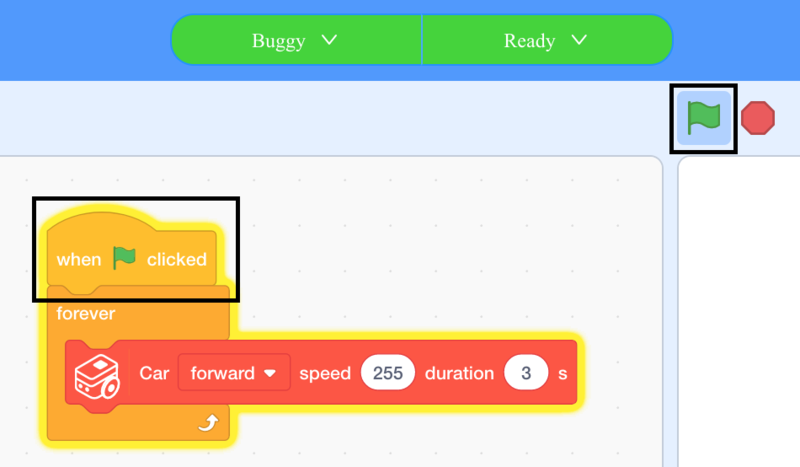 As we have the "start" and "forever" ready, we can start adding some Buggy code blocks to move it around! Inside the C block, let's add some Stack blocks to control the Buggy. Stack blocks are shaped with a notch at the top and a bump on the bottom. They can perform the main commands for the program. For example, this stack block is from "Buggy", and it can control the moving direction, speed and duration time for the Buggy. Now, add this stack block inside "forever". Then, simply press the green flag on the top left or the "start" block to run the program. The Buggy should be running forward now, and there is a yellow frame wrapped around your program as well. 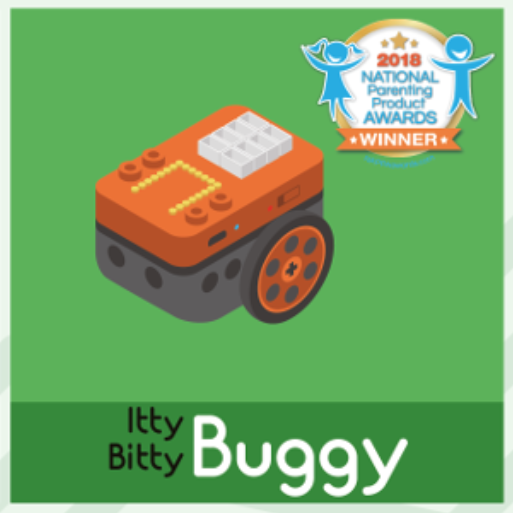 Isn't it awesome to have the Buggy running around on your table? However, you might wonder why Buggy doesn't stop after the 3 seconds duration time.Do you know the reason? It is because the stack block is inside the "forever" loop! According to the description of "forever" C block, it will repeat the contents inside forever. Therefore, after 3 seconds of running duration, the program will do the same thing again, and your Buggy will move for another 3 seconds! Therefore, another Stack block is needed for this command. The "delay"stack block from Control. 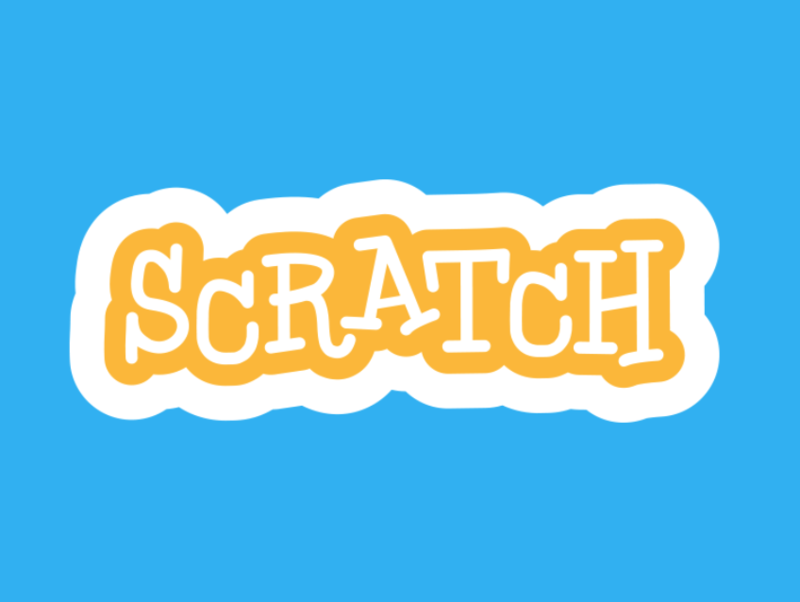 This small block can temporarily stop the program for couple seconds. Let's drag this below the "Buggy moving" Stack block to test it out! 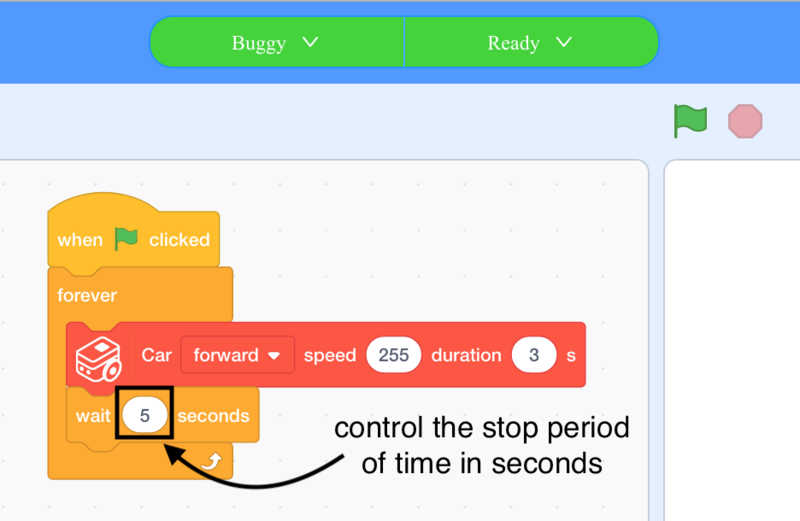 Press the green flag again, the Buggy should move forward for 3 seconds, then stop for 5 seconds, and then repeat this content again. This is the end of the online mode tutorial. Thank you so much for reading! Don't forget to sign up on our IdeaxCollege to become. 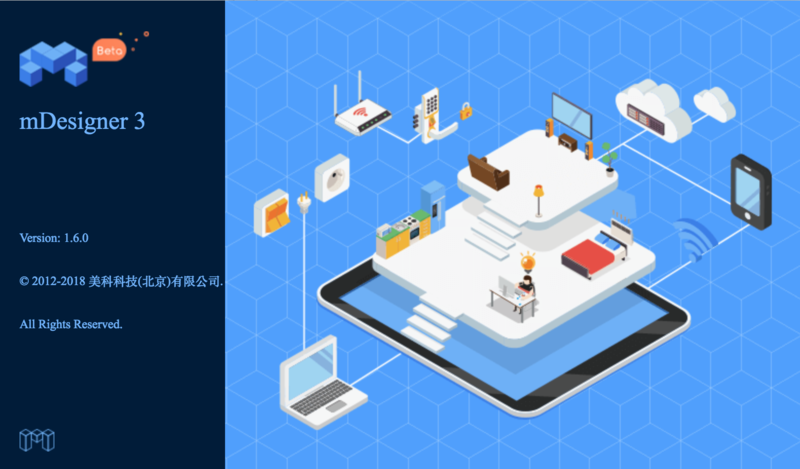 The ideaLab will also upload more tutorials and interesting projects in the future. 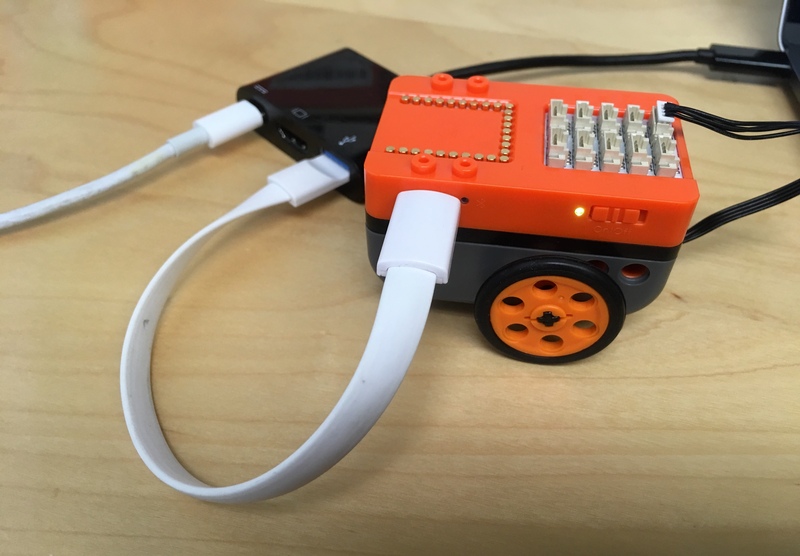 Microduino is also waiting for you to share your creative Buggy inventions on our IdeaLab! If you have any questions, you can contact us under the Q&A webpage. Our technical support will reach out to you and help to solve any issues you have.